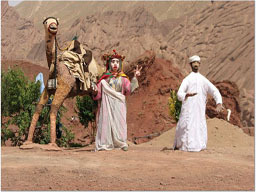 Marrakech and Morocco desert tours: This taste of the fabulous Morocco desert kasbah area and some of the magnificent High Atlas Mountain gorges will leave you wanting more. Join one of our Deluxe Cultural Experience group tours of Morocco or choose to experience this Morocco itinerary privately as one of Berber Treasures Morocco private tours of Morocco. Begin your Morocco desert holidays when you arrive at Marrakech Airport and are met by your Berber Treasures Morocco Tours driver and transferred to your Marrakech riad or hotel. Afternoon half-day city tour of Marrakech, one of Morocco’s incredible old imperial cities, including the UNESCO world heritage old Marrakech medina and souks, La Bahia Palace, el Badi Palace, Koutoubia Mosque and Djemaa el Fna Square. 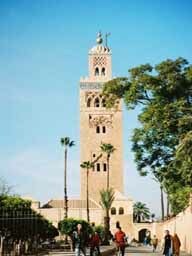 Complete your immersion into magically Marrakech staying in one on the wonderfully atmospheric Marrakech riads. Overnight in Marrakech riad. 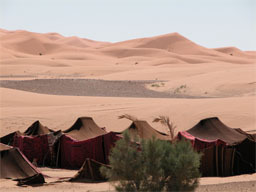 ۞ Tonight you have the option to upgrade your stay in a private ensuite tents at a deluxe desert camp scenically located in the Erg Chebbi sand dunes. Transfer to Marrakech Airport where your Morocco tour ends. EMAIL US now for pricing information, further details and to book your private tour of Morocco. The price of your private tour of Morocco depends on the standard and type of accommodation you seek, the itinerary you choose, the number of people travelling and the time of year you are planning to travel to Morocco. * A single supplement for single client bookings (single room only) applies. Please ask for details. EMAIL US now for this Morocco tours itinerary details and to book your Morocco holidays.